With a stay at Oban Suites İstanbul in Istanbul (Istanbul City Center), you'll be a 3-minute walk from Grand Bazaar and 9 minutes by foot from Hippodrome. Featured amenities include dry cleaning/laundry services, a 24-hour front desk, and luggage storage. A roundtrip airport shuttle is provided for a surcharge (available 24 hours), and self parking (subject to charges) is available onsite. 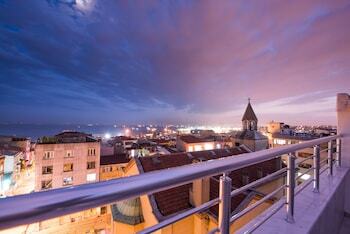 Located in Foca, Hanedan Foca Flora Villas is within a 15-minute drive of Siren Rocks and Fatih Mosque. Featured amenities include dry cleaning/laundry services and a 24-hour front desk.